Microsoft Studios might be calling it Crimson Dragon: Side Story, but this incredibly deep and stylish shooter for the Windows Phone 7 is pure 2D Panzer Dragoon. Side Story is the mobile companion to Crimson Dragon, the Kinect-powered Xbox Live Arcade shooter that last I heard was still in development limbo. The team creating that game includes Yukio Futatsugi, the man who directed the first three Panzer Dragoon titles, so when I tell you that this is a 2D Panzer Dragoon mobile game in everything but name it's more than just hyperbole. The same team is responsible for this title, right down to Panzer Dragoon Orta and Saga composer Saori Kobayashi on music. On the planet Draco, colonized by refugees from Earth, a mysterious indigenous dragon is spreading the Crimsonscale disease, laying waste to human settlements. Players take on the role of a young dragonrider tasked with taking out this threat. Gameplay is essentially that of its inspirations, only from the side. 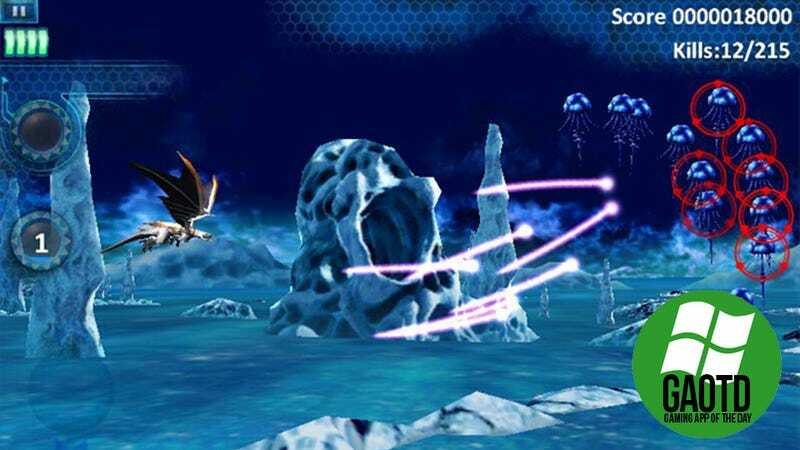 The on-rails gameplay of Panzer Dragoon translates into a side-scrolling shooter in which the player can only move up and down, making it perfect for the mobile phone. Weapons range from auto-firing cannonblasts to those wonderfully familiar homing blasts, fingers on the right hand tracing targets and lifting to let projectiles fly. Crimson Dragon: Side Story goes much deeper than your average side-scrolling shooter, however. There are levels to earn, dragons to breed, and more than 170 different skills to unlock. Those skills rely on specific conditions being met in the game's levels — one might require completing a stage using a specific weapon, another by shooting a certain number of enemies without taking a hit. There's an amazing amount of replayability in this $.99 title, but if players would rather unlock things by spending Microsoft points on gems they can ruin the experience for themselves that way. For those of you familiar with the Panzer Dragoon franchise, all I really had to do to convince you to play Crimson Dragon: Side Story was write that headline. The rest of you don't know what you're missing — now's your chance to find out.